CSR Challenge 2016 - Share Food • Share the Joy is a new function which aims at unleashing university students’ potential in serving the community and to raise their awareness towards corporate social responsibility. Stepping into its second year, HKFBS will continue to establish cordial communication and relationship with other kindred organizations and the community. HKFBS is the leader among business student societies that advocates the importance of Corporate Social Responsibility. This year, we are honored to have Maxim's Group to be our Title Sponsor. Through organizing volunteering sessions to our members and participating in the Group’s 4 core CSR programs, we hope to raise students’ awareness on “Waste Not” and “Helping the Needy”. The whole project targets student teams from 9 local universities from all disciplines, who can contribute to the society by generating creative new CSR ideas for the company. 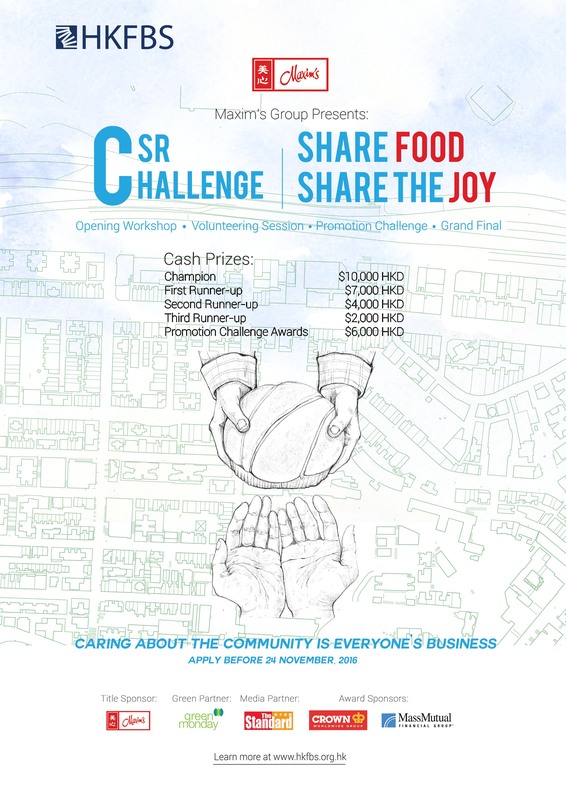 CSR Challenge 2016 - Share Food• Share the Joy consists of 4 components, namely the Opening Workshop, Volunteering Session, Promotion Challenge, and Grand Final. Each element is connected and accompanied with relevant activities to reach the goals of sustaining existing CSR campaigns and generating innovative CSR ideas. The whole assessment process will be conducted by the Evaluation Committee from our Title Sponsor and NGO partner, Green Monday. “Maxim’s” and any name, logo, or trademark of any restaurants and any intellectual property right therein used or referenced in this website/page belong to Maxim’s Caterers Limited, as company operating in Hong Kong, and/or its affiliates. The copyright of these aforementioned materials belong to Maxim’s Caterers Limited. All rights are hereby reserved.